So I basically wanted to do a review. I have been wanting to do one of these for a little while now but I had to use it for about a week to let you know what I really thought. For starters I don't wear liquid foundation but now I might have to reconsider. I usually wear urban decy's mineral foundation, but I really like the coverage this gives me and how smooth and light it feels. AND my favorite thing about this foundation is that is helps lock in my shine. My face is really oily so this does help it A LOT! I highly recommend this especially if your looking for a new one for the summer because this coverage is amazing! 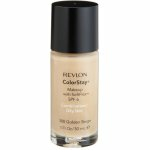 What foundation do you wear for the summer? ?